a papulopustular inflammation of the hair follicles, usually of the beard. sycosis bar´bae a staphylococcal infection and irritation of the hair follicles in the beard region; it may be associated with other superficial bacterial infections such as impetigo or furunculosis. Symptoms include burning, itching, and pain, with formation of small papules and pustules that drain, form crusts, and leave scars when they heal. The condition is treated with bland hot compresses, antibiotics applied locally and administered parenterally, and manual epilation of the infected hairs. Scrupulous cleanliness and personal hygiene are necessary to prevent reinfection. Called also barber's itch, folliculitis barbae, and sycosis vulgaris. lupoid sycosis a chronic, scarring form of deep sycosis barbae. an inflammation of hair follicles of skin that has been shaved. Treatment includes light and infrequent shaving, topical and systemic antibiotics, and daily plucking of infected hairs. Also called barber's itch, sycosis vulgaris. 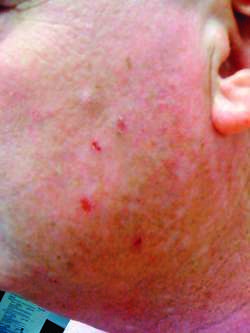 Sycosis of the beard marked by papules and pustules perforated by hairs and surrounded by infiltrated skin. Barber's itch. An infection of hair follicles in the beard area, usually with Staphylococcus aureus , acquired from infected razors or towels. Treatment is with antibiotic drugs and temporary avoidance of shaving.